The Government Accountability Office (GAO) released a report today detailing the costs to the government for four of Donald Trump's visits to Mar-a-Lago in early 2017, finding the bill for the four trips came to $13.6 million. 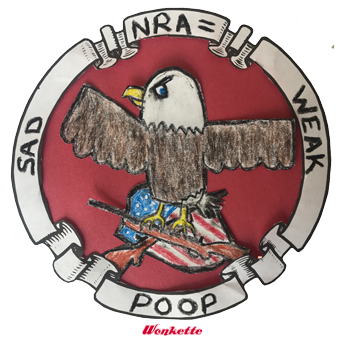 On average, that's about $3.4 million per shot, a little less than a widely reported guesstimate of $3.6 million that Politifact rated only "Half True" in April 2017. 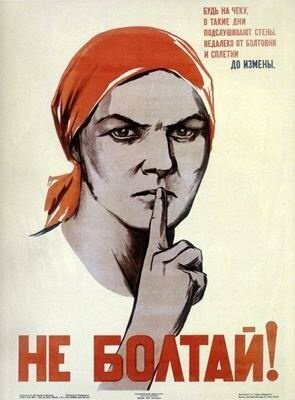 We expect the fact-checkers will update their analysis based on the new report and keep the rating the same, while the Washington Post's Fact Checker will feel compelled to tot up the costs of Alexandria Ocasio-Cortez's trips to Hot Topic, for balance. Oh, yes, and it's a hell of a lot more expensive than the fanciful estimate of just One Million Dollars per Florida trip floated by the rightwing outfit Judicial Watch in 2017. The biggest expense for the trips was the operational costs of the military equipment -- not just Air Force One, but also the Marine One helicopter that flies presidents from the White House to Andrews Air Force Base, plus the cargo plane that lugs the limousines around and little things like Coast Guard patrol boats. Those costs came to $10.6 million, while "temporary duty costs" -- representing the extra costs of personnel for the trips -- took up the other $3 million. That doesn't include stuff like Secret Service agents' salaries, since those would be paid anyway, but it does include stuff like their hotel rooms and the chicken sandwiches at the Trump Doral golf club, which were disappointingly dry, all things considered. The GAO estimates in the full report that the government shelled out $60,000 to Mar-a-Lago itself for total expenses for the four trips, which isn't going to break the bank, but isn't chicken feed either (mixed metaphors, however, were free). $60K? That's like, what, six or seven bananas at most. Or enough to pay three undocumented maids for a year. 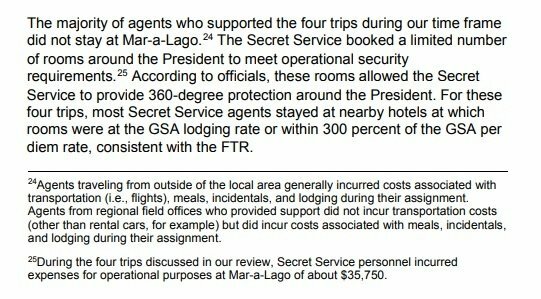 Also, you will maybe be glad to know that despite Trump's efforts to monetize every possible aspect of his presidency, the Secret Service and other agencies tasked with Trump's safety really do try to economize where they can, as we found tucked away elsewhere in the report (we've taken layout liberties, but the info is verbatim -- and "FTR" is "Federal Travel Regulation"). Curiously enough, while the GAO report mentions "golf carts" as one of the items included under operational expenses, the cost breakdown gets no more specific than that, so the report neither confirms nor denies those media reports that golf cart rentals cost $150,000, paid to Trump companies -- and FactCheck dot Org determined the Secret Service gets its golf carts from independent vendors anyway. Another fake news story debunked. Then again, Trumpers don't believe the professional fact checkers anyway, so who knows what's real, huh? 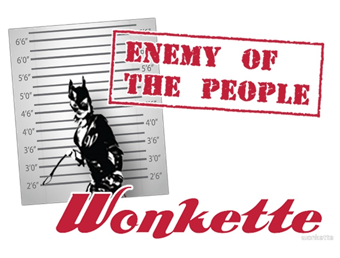 The report, requested by congressional Democrats, doesn't have any shocking shockers in it. The costs of protecting a traveling president tend not to vary a lot, but it's probably worth noting that Donald Trump racked up 26 visits to Florida (12 in 2017, 14 in 2018) in the first two years of his presidency -- only a few of them didn't include a stay at Mar-a-Lago. 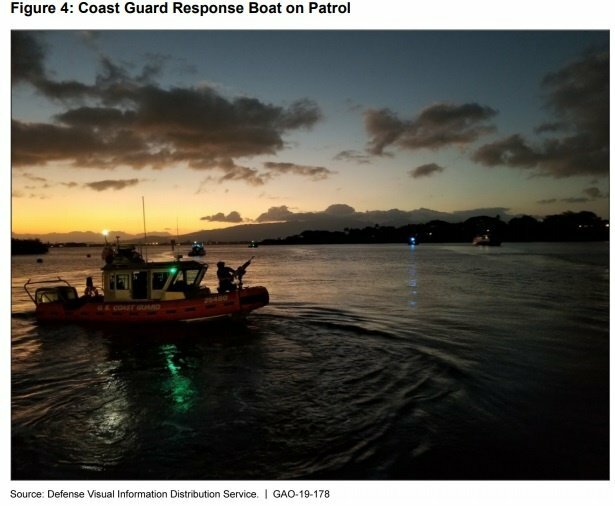 In conclusion, here is a pretty picture of a Coast Guard response boat from the report. 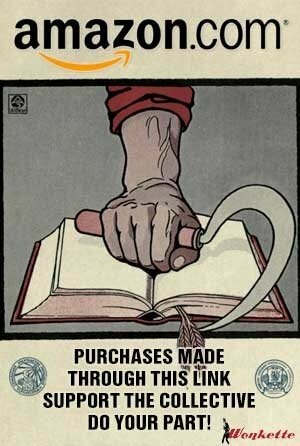 You paid for it! Enjoy! 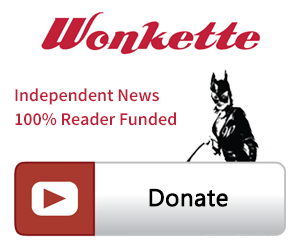 Yr Wonkette is supported by you the reader. Send us money and we'll fix our own darn sammiches.